Sentence of Penitence: With what shall I come before the Lord, and bow myself before God on high? He has shown you, O man, what is good; and what does the Lord require of you but to do justice, and to love kindness, and to walk humbly with your God? I had three things on his mind this morning, the third Sunday morning in Lent. Last night I watched ‘Eat, Pray, Love‘ with my wife. We found it very interesting, as well as entertaining, but it also left us feeling uneasy about how ‘easy’ it might be to ‘rediscover’ yourself, and God, without the responsibilities and obligations of ‘raising a family’, very much a part of marriage for most. While we found Julia Roberts‘ character rather self-indulgent, though religiously seeking truth, her ‘third’ lover redeemed the film for me, but I won’t spoil the ending for you. In the film, the result of Liz’s untutored attempts to open up a direct dialogue with God was her decision to leave a relationship, a marriage, in which both partners felt unsatisfied. She asked God to tell her what to do, but then took the decision herself, that night. She was impatient for an answer and was not prepared to wait on God. Her husband had suggested that they should stay together because they couldn’t bear to be apart. However, she leaves her marriage and embarks on both an inner and outward pilgrimage with Rome, India and Bali as backdrops. On the radio this morning, someone referred to the Gadarene Demoniac as an example of what happens when evil spirits control us – they become impatient for a solution and we get driven off the precipice like the hapless pigs! The Church is just as capable of self-destruction in its decision-making as the rest of us. Clerical cloth of any colour is no guarantee of its ability to exorcise its own demons, especially in the man-made institutions of the Anglican Church, though I didn’t agree with the speaker that this was a case in point. Neither was I wasn’t convinced that things were so bad for the film characters Liz and her husband that she needed to press the self-destruct button in her relationship, or, indeed, that God would be prompting her to do so. And, if God was not doing the prompting, could she recognise that someone or something else might be doing the prompting? I also wondered if, had there been children in their marriage, she would be in such a hurry to ‘rediscover’ her individual identity, or, indeed, whether she would have the time and resources to do so. This leads me into my second point, which is about marriage itself. In breaking her marriage, was Liz defining it, in purely ‘secular’ terms as a partnership, and one which, as her husband angrily pointed out, was not necessarily ’till death do us part’ but more like ’till indifference do us part’. Without wishing to judge even fictional individuals, this is a redefinition in terms of human gratification and selfishness, it seems to me, which has little to do with the Christian view of marriage. In which case, I found myself wondering, why did Liz want to get married in the first place? Maybe the Church doesn’t own the definition of marriage, but then is it right for the state to reduce its meaning to the lowest common denominator of social institutions. If marriage is simply about what any two people want from each other, then why involve the civil law or the Church at all? Why not just do what many of our ancestors did and simply have a ‘Common Law’ arrangement? After thousands of years of marriage being defined as ‘the union between a man and a woman’, we now seem to being pushed into a redefinition which will fundamentally alter the legal and religious basis of family life in Britain. In making this point, I am not making an anti-gay one. Like some of the Catholic leaders who spoke this morning, and, indeed, the new Dean of St Paul’s, I am concerned that we are, to use a Mathematical metaphor, simply getting our sums mixed up. Marriage is ‘two into one’, not ‘one plus one’. It’s about two individuals giving up their rights as individuals to become one human family and thereafter to ‘multiply’, if you like. In the current debate, the rights of perhaps the most important parties to the marriage, the children, have been so far ignored, and it is not hypocrisy for the largest Christian community, the Catholic Church, to have a view on this, just because some of its members have shamefully trampled on those rights, or because others honour God’s call to celibacy, like Jesus and St Paul before them. The argument that ‘Gay Marriage’ is allowed in many ‘Catholic countries’ ignores the point that in those countries it is allowed by the state, not the Church. In Britain, not entirely uniquely, marriage is defined jointly by the ‘national’ Churches of England, Scotland and Wales, and by UK Law. Many Christians would like to see an amicable ‘divorce’ between these two, a separation between Church and State, which would allow for a separate, purely secular definition of marriage, but many Christians would still want one marriage service, and not to have to go to the Registry Office first, as happens here in Hungary. Why, indeed, shouldn’t they, and why should there not be a separate, different but equal, service for those wanting a ‘one plus one’ legal covenant witnessed in Church? Alternatively, couples of whatever gender could have their partnerships blessed in Church, borrowing lines from the marriage service, as already happens in many cases. Why does everyone have to feel pushed into a ‘one size fits all’ legal arrangement out of a false identification of a need for ‘absolute equality’ rather than justice, fairness and equity? Why should I be made to feel that my marriage of 22 years and 2 children is about to be ‘down-graded’ from a ‘family affair’ to a legal contract? So ‘rediscovering your divinity’ and ‘redefining marriage’ are two themes. The third? …. Not so different from the first two really…. In the Lent Gospel, Jesus’ teaching is not simply about the evil and destructiveness of division in a family or a country, it is about the ‘indivisibility’ of these human institutions, if they are inspired by God. Put simply, you can no more have Good fighting Good than Evil fighting Evil. Perhaps that’s why we call our football teams ‘United’ and Man Utd are known as the ‘Red Devils’. It’s perhaps not entirely unconnected that two football teams in continuing difficulties have recently sacked their managers, my team being one of them. In one case, the manager had been in charge for several years, and the supporters, hungry for success, finally ran out of patience. In another, the manager, the players and the owner were all divided against each other, and the manager didn’t even survive one season. In both cases, it was passionate impatience which led to the divisions and sackings. To take Jesus’ other example, we can see many countries which are divided among themselves, including the ‘United’ Kingdom. I am English, but my identity is also defined by the Welsh, Scots and Irish I have always had around me in Britain, and I consider myself ‘British’ too. After all, ‘what knows he of England who only England knows?’ I am married to a Hungarian, so that makes my sons ‘half-British’ and ‘half-Hungarian’ doesn’t it? Of course not, how or where would you divide them?! Not even the wisdom of Solomon could do that! No, they are both fully Hungarian and fully British! No halves, no hyphens! I now live in Hungary, where there are many current divisions over social, economic and political issues. However, on Thursday next week, the country will remember its unity and independence at the time of the 1848-9 Uprising against the Austrians. It has also survived invasions and occupations by Mongols, Turks and Soviet Russians. It has had two-thirds of its territory taken away, but its people have remained united in the face of these adversities, keeping their unique language and culture intact. When Jesus refers to ‘division’ he is not simply referring to separation, divorce or civil war. He is referring to the very idea of the family and the country in human society as inspired by God’s Will, as well as by our human instincts. To keep and maintain these institutions, we need divine grace and patience. Without these atomic building blocks intact, human society cannot survive. It will destroy itself. Goodness, like Evil, is uncountable. There is no ‘Greater Goodness’ or ‘Lesser Evil’. They are both indivisible. O lord, whose love has brought us to know you, and whose power drives out the evil inside us, help us to fill our lives with obedience to your will, so that your indwelling may be complete, and evil find no home in our hearts; through the power of your Spirit. Amen. This is based on Reflections for Lent I gave at our ‘Home Sunday School‘ as international teachers in Pécs, Hungary, in the 1990’s. Jesus said: If any man would come after me, let him deny himself and take up his cross daily and follow me. Train yourselves in godliness; for while bodily training is of some value, godliness is of value in every way, as it holds promise for the present life and also for the life to come. O Lord God, who knowest that we have many temptations to conquer, many evils to shun, many difficulties to overcome, and as many opportunities of good: so order our doings that we observe in all things the perfect rule of Christ, and set ourselves to serve thee first, others next, and ourselves last; through the same Jesus Christ our Lord. AMEN. Jesus went away from Jordan River, his heart filled with God’s Spirit. And God led him out on to the lonely moorlands. He was there many a long day. He was being tested; he had to think things out; what did God want him to do? All this time he had nothing to eat, and at the end he was very hungry indeed. This coversation took place in his mind: Jesus imagined himself to be sometimes on the moorlands themselves, sometimes on the top of a very high mountain, sometimes standing on the top of the Temple Gate in Jerusalem. Voice: If you are God’s Son, tell this stone to become a loaf of bread. Jesus: The Bible says: Bread is not the only thing a man needs to live on. Voice: I will give you all the power of these great countries and their royal splendour. It is all mine – mine to give to anybody I want to. It can all be yours – on one condition; you must take me for your King – not God. Jesus: The Bible says: God himself must be your King; you must be his servant and his servant only. Voice: If you are God’s Son jump down from this high place. The Bible says: God will command his angels to look after you. And again the Bible says: Their hands will hold you fast – you won’t even stub your toe on a stone. Jesus: The Bible also says: You must not put God to the test. The testing time of Jesus was over – but it was not the last test he had to face. He had long thought about what kind of leader God’s ‘Chosen Leader’ would be….Now he knew that to be ‘the leader of his people’ was the job God had given him to do. He had to make a final decision. He faced the great crisis of his life – but not the last crisis. It was one thing to try things out in Nazareth; it was another to find himself shaken by a profound religious experience in which he believed God was, as it were, commissioning him for this great work. All he had read in the Old Testament, all he had become aware of in his own experience of God, all the ideas and convictions that had become clear in debate and argument with freedom-fighters and the rabbis met in one explosive moment. What kind of work was this to be? Jesus went out into the lonely hills to pray and think things out. The ‘temptations’ or ‘testings’ Jesus faced came from the different ways in which he could have been the leader of his people. He turned them all down. The words of refusal he used all come from the great ‘Law Book’ in the Old Testament (Deuteronomy) – a book he loved. It is as if he is saying, ‘No, that’s not God’s Way‘ (69-70). the time when some people give up luxuries in order to assume new duties. The time when some people do their Spring cleaning, and buy new clothes for Easter. But what did you do Lord to make this season what it is? You got away from people: away from the distracting things of daily life, because you wanted to listen to your Father and find his way to conquer evil and liberate your friends. Then you returned and met life at the points where good and evil meet, and everybody saw the power of God in you. So what do I do Lord in this restless age? The terrible temptation is to rush around every day being busy. There is a terrible temptation to think I can’t find time for quiet, or even find a quiet place. But in my heart of hearts I know that I need you. I must make time and find a place: a time and a place to learn the art of listening, Lord, and get to know you better. That’s what I’ll do this Lent, Lord. ‘Penance’ or ‘Repentance’ means a change of heart. These are real changes in our lives, and the way we reflect on them represents our process of growing up. This is mirrored in our spiritual life by our ‘growing in grace’, for we are not the victims of ‘fate’ or ‘chance’. We make changes through God’s grace and learn to manage other changes which come our way. The message of Lent is concerned with these spiritual processes; growing up, learning to make and manage change, learning to find God’s Way, which is not always our own way. The biggest change in my own life, becoming a father, has challenged me to listen to words I first heard as a teenager in new ways. In particular, two songs by the folk-singer Harvey Andrews have taken on fresh meanings. The first speaks of the awesome responsibility of bringing a child into today’s world. The second reflects on the changing relationships between a son and his father and evokes a spirit of repentance in the son towards his father which many of us can, I’m sure, identify with very strongly from our own experiences. I’ve often thought about the relationship between Jesus and Joseph, perhaps because my work, my life as a teacher, was only just beginning when my father died. He too, like Joseph and Jesus, was a craftsman, a draughtsman in a Black Country steel-works. Like Jesus, coming from a working-class background with family responsibilities, he didn’t begin his ministry until he was in his thirties. How, I wonder, had Joseph felt about Jesus’ abrupt question in the Temple, ‘did you not know that I must be about my Father’s business?’ The gospels tell us nothing of their relationship through Jesus’ teens and twenties when he kept to his earthly father’s business, honouring his apprenticeship as a carpenter, despite the ‘radicalisation’ of other young men around him, some of whom must have already died as ‘freedom-fighters’ against the Romans in what the Zealots saw as a ‘Holy Struggle’ in which God was calling them to become martyrs. Significantly, his ministry begins with both a change of physical location as he goes south to join John at the Jordan, and a change of spiritual direction, as he accepts Baptism, the Act of Repentance, from his cousin. This was not an admission of previous guilt so much as a recognition of the turning point his acceptance of the call to ministry involved, as he sets off in a different direction into the wilderness to reflect of the momentous change that his public announcement would bring about, a course which would lead to conflict and confrontation with the religious and political leaders in Jerusalem, as well as with some of his own people in Galilee. Dale’s paraphrasing of the wilderness experience brings out Jesus’ inner journey to find God’s Way, reflecting on his past in order to make a decision about what kind of leader he would be. In order for us to grow, through grace, into God’s Way, we too need periods of quiet reflection when we can listen to the struggling voices within us, silence them and come to terms with the decisions we need to make in order to change course into the path that God wants us to take. The turning points we face will be much more ‘incremental’ and far less radical than those faced by Jesus, but they need patient endeavour and endurance. Lord, we are hungry for the knowledge of the next step we must take. Give to us the long patience of Christ that we, like him, may not decide our future in haste; mercifully grant that hunger for an improvement in our lot; hunger for release from tension or anxiety; hunger for success in your service; or any other kind of appetite for things hidden in the future, may not stampede the soul into premature decisions. Instead of turning these stones of impatience into the bread of hasty action, may it be our meat and drink to do your will, and like the Saviour find that we have meat to eat we knew not of. Make us not to hunger for tomorrow, but to hunger and thirst after righteousness, in the sure knowledge that they who do so shall be filled; through Jesus Christ our Lord. AMEN. ‘One day the governor of Scarborough Castle came to see me. I desired him to go into my room…and it was so filled with smoke from the little fire that when they were in it they could hardly find their way out again…(After) I was removed into a worse room where I had neither chimney nor fire hearth. This being to the sea-side, the wind drove in the rain forcibly, so that the water came over my bed and ran about the room. And when my clothes were wet, I had no fire to dry them; so that my body was benumbed with cold and my fingers swelled…The officers often threatened that I should be hanged over the wall…But I told them that if that was what they desired and it was permitted them, I was ready; for I never feared death nor suffering in my life’. Fox was later better treated by the governor, who tried to get him released and the leading Quaker’s fearless suffering changed not just the governor’s attitude, but also that of the officers and soldiers, who reported him to be ‘as stiff as a tree and as pure as a bell; for we could never bow him’. Nor was Fox alone in this example of endurance. From the time of the Act of Uniformity of 1662 to the Toleration Act of 1689, the Quaker movement continued to grow, despite, perhaps because of, imprisonment and persecution. At least 21,000 ‘Friends’ suffered fines or prison sentences, many more than once, and at least 450 died in prison, or as a result of their sufferings while in prison. But whatever was done to them, like George Fox, they held firm. ‘Only that those coming after may not be deluded I shall truly tell them that lying most impudently is become so ordinary a trade…that I must confess it hath greatly depressed my esteem of most history and of human nature’. Of course, this view of human nature was one point on which he would have quarrelled with the Quakers, whose doctrine of ‘the inner light’ of the divine in each one of us led them to proclaim the essential goodness of human nature, in conflict with the more Calvinist view of its sinfulness held by Baxter and most Protestants of all persuasions at the time. The doctrine of ‘that of God in everyone’ also led to their rejection of a professional, trained ministry, and the 1667 ‘convincement’ of courtiers like William Penn, the son of Admiral Penn who appears in Pepys’ Diary, of these beliefs, had led the authorities to think that their might be plotters among the movement, despite its declared pacifism. 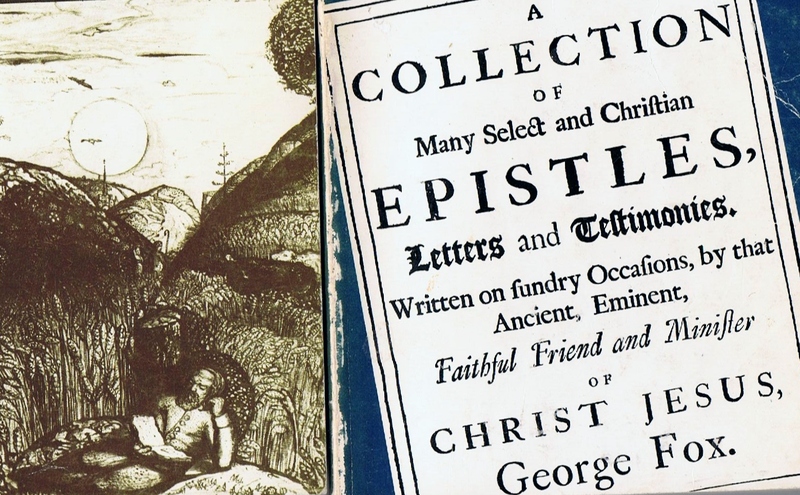 Quakers were mostly of low birth, but they had ‘Friends in high places’ and their beliefs were therefore seen as a direct challenge to the authorities of Christ, the Church and the Stuart state. Baxter, of course, respected them, and had made a public show of this by holding a public disputation with Penn at Rickmansworth, in which he nevertheless tried to correct what he saw as their doctrinal errors. One day, all these things will surely be understood and it will be seen what a sad and foolish thing it is that one set of Protestant Christians are made to persecute another set. I am not concerned to answer such stuff (as I am accused of) but am ready to produce my writings, and my life and conversation is known to many in this nation’. The jury had been hand-picked by Jeffreys and didn’t even bother to leave the court to reach their ‘Guilty’ verdict. Baxter was fined 500 marks, but Jeffrey’s attempts to have the ‘old knave’ whipped through the streets, was ‘stamped on’ by all the other judges. Later the same year, however, Jeffreys did have his fill of bloodshed and cruelty against the Nonconformist agricultural workers of the West of England who rose up in support of the Duke of Monmouth’s ‘Pitchfork’ Rebellion against the tyrannical rule of James II. Monmouth, Charles II’s son by an earlier, secret ‘marriage’, landed at Lyme Regis and gathered his supporters together in Dorset before marching into Somerset, where he was defeated at the Battle of Sedgemoor. Jeffreys was sent to try the poor farmers and fishermen who had followed him, hanging as many of them as he could in what became known as the Bloody Assizes. When his master, James II, was forced to flee England in 1688, ‘the hanging judge’ Jeffreys tried to escape disguised as a sailor. However, he was recognised trying to board a ship in Wapping, and was nearly torn apart by the angry crowd. He was rescued and sent to the Tower, but never recovered from the ‘justice’ he had received at the hands of the people. Meanwhile, refusing to pay the fine which had been imposed on him, Baxter remained in prison for eighteen months, until, in a belated attempt to appease the Nonconformists, the beleaguered James II released him. Baxter continued to preach at Charterhouse Yard to crowds reported to be bigger than any Cathedral congregation in England. William III’s Parliament passed a ‘Toleration Act’ in 1689 which grant the right of religious worship to Protestant non-conformists as long as they agreed to certain tests. Baxter persuaded many of his friends to agree to these, but died in December 1691, sad that there still had to be divisions and quarrels and that his dream of one Church was still only a dream. Although everyone was allowed to worship as they liked, Catholics and Nonconformists were not yet allowed to go to the universities or take jobs in the government, including the standing army and the Royal Navy. This meant they were still excluded from public service and the ‘mainstream’ of ‘established’ English society, though they were no longer punished for their beliefs and could build any sort of chapel or church they liked to worship in. Sing thou the songs of love. In 1838 John Hampden Gurney took Baxter’s verses as the basis of a new hymn, which became a favourite congregational hymn. An Anglican educated at Cambridge, after 23 years as a curate at Lutterworth in Leicestershire, he became rector at St Mary’s, Bryanston Square in London and in 1857 was made prebendary of St Paul’s Cathedral. So, Baxter’s words were brought home to the City of London. However, if there’s one group of people to which Baxter’s ‘well-tuned heart’ belongs, it is not the Church of England, nor even his parishioners in Bridgnorth or Kidderminster, nor John Hampden and the independent soldiers of Cromwell’s Army, nor the Royalists of Charles II’s Restoration, nor the Protestant Nonconformists. He belongs to all those believers persecuted for righteousness’ sake and, above all, to to all those who, like him, deserve the blessing, Blessed are the Peacemakers for they shall be called the Children of God. When John Bunyan had been brought before the judge in 1660 he had been told that if he did not stop preaching he would be hung. He replied, ‘If I were out of prison today, I would preach again tomorrow, by the help of God’. He remained in prison for twelve years, during which time he wrote many books, including The Pigrim’s Progress, once to be found in almost every home in England. He had friends, even among the judiciary, like Sir Matthew Hale, who tried to get him out of prison and who also helped Richard Baxter, when he, too, found himself in prison after 1672. 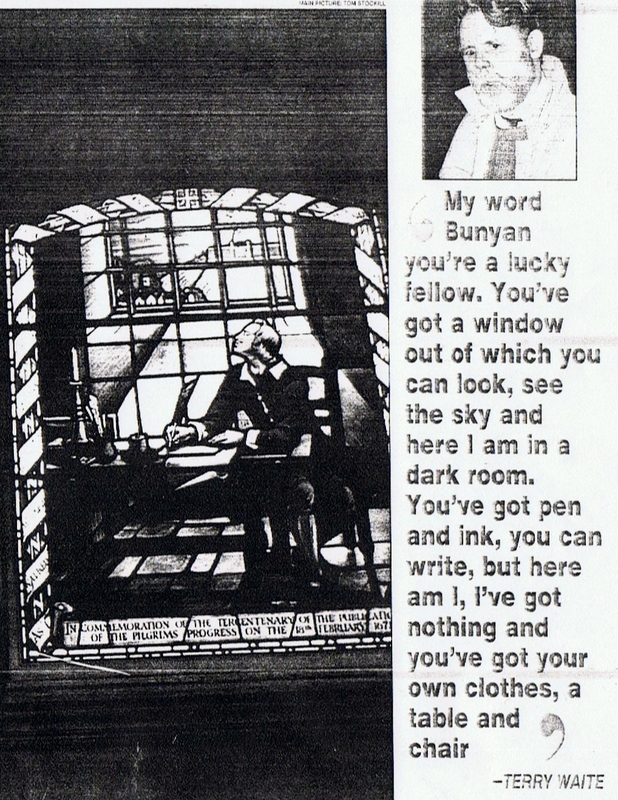 The picture below shows Bunyan in the stained glass window which was installed in Bedford Free Church for the 300th anniversary of The Pilgrim’s Progress in 1978. Terry Waite said that the message boosted his hopes more than anything else during the darkest days of his captivity, despite his envy of Bunyan’s apperently better conditions. From house and goods and dearest friends? A place wherein to put my head. None can its liberty control. In the period of Bunyan and Baxter prisons were very crowded and unhealthy. In winter they were bitterly cold and damp, and in summer they were full of flies and rats, spreading disease. Baxter became ill and may have died had his friends not managed to get him released before his sentence was over. However, after his release, he could not return to his house in Acton, but had to spend the winter in lodgings near Barnet. He could not preach, but continued to write to help men settle their quarrels. He received letters from many ministers who had also lost their homes because of the Act of Uniformity. One wrote that his wife and children had lived ever since his ejectment on black rye-bread and water, and another that he had to spin all day and night to make a living. James, Duke of York, Charles II’s brother and heir, was Roman Catholic and Charles was also secretly a Catholic. He wished to protect the Catholics. Left to himself, he would probably have allowed both Catholics and Non-conformists to worship in freedom, but Parliament wanted to uphold the Act of Uniformity. However, many magistrates understood the King’s sympathies and allowed preaching in private homes. In 1672 the King went further in issuing a ‘Declaration of Indulgence‘ which granted licenses for preaching to some non-conformist preachers, Baxter among them. He came back to London and settled in Bloomsbury, but Parliament soon forced Charles to put an end to the Declaration, and it wasn’t long before Baxter found himself in danger of being imprisoned once more. Despite feeling too ill to travel, three friends persuaded him to leave London for Hertfordshire, and he therefore avoided six months in a common prison, which probably would have killed him. As a result, the authorities simply didn’t know what to do with the Quakers, who showed so little fear and so much firmness. They crammed them into prison, but they still held their meetings there. They told their jailers that ‘they might as well stop the sun from shining, or the tide from flowing whilst two of them were left together’. The children showed the same courage as their parents. At Bristol, Reading and Cambridge, when all the men and women were in prison, the children continued the meetings. A letter to George Fox, dated November 15th, 1664, says that ‘our little children kept up the meeting when we were all in prison‘, so that ‘the wicked justice, when he came and found them there, beat them with a staff he had with a spear in it’. In Bristol, the children were also savagely beaten, but ‘bore it patiently and cheerfully’ and ‘were unmoveable’. When Aneurin Bevan came to Coventry to make an impassioned defence of the Labour Government‘s housing policy in the summer of 1947, challenging Anthony Eden to debate the issue, he was given ‘a great reception from the people of Coventry, in particular from members of the Welsh Community, many of whom knew him in their native valleys.’ (1) His choice of this ‘Blitzed’ city was an apt one, since the city had become, like Bevan’s work itself, a symbol of a municipal socialism which was born out of the determination of leaders and led alike to attain better living conditions than many of them had been forced to endure for much of the inter-war period. These were new leaders and this was a re-made working class; the memory of the depression years had become, and remained, as powerful a motive force for social transformation throughout the new industry areas of the Midlands and the South East of England as ‘the Spirit of the Blitz’. In Coventry itself, municipal socialism was already a decade old and the workers who cheered Bevan had re-made themselves, and were determined to maintain their autonomy. The scale of the demographic changes which the British people had experienced in the two decades between the wars had been confirmed to the Labour movement in 1943, when the Fabian Society published a report by Mark Abrams, who had shown that whereas between 1911 and 1929, a high level of net emigration from Britain had been maintained at 50,000 per year, the world-wide depression had rapidly closed the doors to migrants wishing to go overseas, so that between 1931 and 1939 Great Britain gained 525,000 by migration, almost cancelling out the losses of the previous decade. Besides the influx of immigrants from both parts of Ireland and the refugees from Germany and Central Europe, much of this ‘turn-around’ in the statistics was the result of Britain retaining its population increase through internal, long-distance migration to the Midlands and South-East of England from the north of England, Scotland and south Wales. Whilst in the 120 years to 1921 the population of these ‘old’ industrial areas increased seven-fold, from 1921 to 1938, 86% of the 3,343,000 total population growth was concentrated in the ‘new’ industry towns of the Midlands and the South of England, including those of ‘Greater London’ as it later became known. Abrams observed that these trends had been due largely to migration, rather than to any natural increase. (2) However, to understand the nature and effect of this immigration into these towns and areas, it is essential to go behind the ice-cube precision of the statistics, important as such quantitative evidence is, to the many and varied real-life narratives of individuals, families and communities with their own ‘organic’ social networks. This collective experience of migration to these areas also contrasted sharply with the atomised experiences of those who migrated, often under a greater degree of governmental constraint or direction, to ‘Greater London’. It was this latter group of young, single men which attracted most attention in the social service movement and its reports were critical of the London Welsh societies which it claimed were ‘concerned mainly in preserving in the Welsh colonies the Welsh language, culture and traditional interests’; most of the transferees from south Wales knew ‘little or nothing’ of these. Their sense of isolation was intensified by the Ministry’s deliberate policy of mixing transferees from different home areas in order ‘to diminish the overpowering “home” affinities and thus increase the chances of assimilation in their new community.’ (15) This policy was undoubtedly counter-productive, working against the grain of Welsh migration traditions. This ‘networking’ was a primary feature of voluntary migration, in contrast with government Transference programmes. It extended far beyond the bounds of kith and kin and became something of an institution in itself, operating between the valleys and the recipient towns and cities. Often it was a daughter or son who secured the first job and the strength of family solidarity would lead, eventually, to its reunification in the new area. Once a family had become established in the new area, fresh impetus was given to the migration of additional relatives and friends, followed by casual acquaintances or even comparative strangers. In this way, a multiplier effect was created whereby large numbers of people migrated from a particular locality in South Wales to a particular area of the Midlands. For instance, one family from Cwmamman was responsible for the removal of a further thirty-six families from the village. (21) In this way, small numbers of initial migrants determined the subsequent predominant direction of the migration from their localities, so that substantial pockets of people from particular coalfield communities were to be found in particular Midland cities by the end of the l930s. In general, there appears to have been a preponderance of Rhondda people among the migrants to Coventry, while Birmingham seems to have attracted a good number of workers from the Monmouthshire valleys, and Oxford, or more particularly Cowley, was the chosen destination for many from the ‘Bridgend valleys’. The second major feature of the migration, cultural retention, was not only a product of the collective migration experience but also a paramount part of the process itself since the presence, or lack, of Welsh cultural institutions in the new areas was a strong factor in determining the direction of the out-flow from the coalfield. These institutions acted as bonding agents in the lives of migrants, providing them with a badge of identity and helping them to convey a notion of respectability to those among whom they settled. The institutions were often, in part, the outward expression of the immigrants’ inner idealised image of the communities they had left behind. To paraphrase Idris Davies’ 1930’s poem, they grew sentimental in Oxford over things that they had smiled at in Wales, and in Coventry they saw the mining valleys more beautiful then they ever saw them with their eyes. (22) It was these ‘imagined’ valleys which fired the imaginations of the Welsh working class communities in the Midlands, empowering the exiles to circumnavigate the economic, social and cultural obstacles to their acceptance. A social solidarity reinforced by the re-enactment of this idealised image of ‘the valleys’ provided protection against a tangible atmosphere of precariousness and prejudice. One of the leaders of this ‘deputation’ was Tom Harris, a crane operator in that shop. His personal narrative is worth telling because it reflected the earlier transatlantic experience of Welsh migration and its tidal impact on the British trade union movement both before and after the Great War. Born in Monmouthshire in the early l890s, he had emigrated to the Welsh-American town of Scranton, Pennsylvania, in his early twenties. There he had worked as a miner and, significantly, had gained organising experience by assisting John L Lewis in building up the United Mineworkers (UMWA). Returning to South Wales in the mid-l920s, possibly to Maesteg, he became active in the SWMF before arriving in Cowley shortly before the strike of l934, to work at the ‘American’ Pressed Steel Works, a connection that may not have been entirely coincidental. (52) Harris and the other members of the unofficial deputation planned the strike action over the weekend following the wage-cut, and one of their Welsh wives, joining in the lengthy discussion, suggested that the deputation should send representatives to ask for assistance from the local Communist Party, since ‘the Communist Party had provided invaluable help and assistance in organising the miner’s struggles in Wales.’ (53) This decision to involve the Communist Party was based on a reflexive response to immediate conditions emerging from a long-held desire of a largely immigrant workforce to retain and establish their trade union principles in their new industrial context. The Glee Party, as in Cowley, provided an important focal point for the Welsh immigrants to Coventry. In fact, since the Welsh were more disparate than in Cowley, it was even more important. It also became a means of encouraging social solidarity through the projection of an idealised image of a respectable, Nonconformist Wales. Jehu was also choirmaster at Queens Road Baptist Church from l926, but in l937 he decided that he had to give up this duty in favour of keeping the Gleemen together, because ‘most of them didn’t go to church, some of them liked to drink…and he felt he must keep them together’ (76) In February l926 they gave two concerts in one week, one to raise money in aid of the Mayor’s Fund for the Distressed Areas. This was well-attended and was presided over by Philip Handley, the Manager of Coventry Employment Exchange, who appealed to the audience on behalf of the distressed miners who, he said, ‘deserved heaven’s interest and sympathy.’ Engagements such as this, combined with his employment exchange and social service work, led Handley to champion the immigrant cause, often in the face of criticism from other civic leaders, trade unionists and employers. He attempted to counter much of the negative propaganda with a positive vision of a progressive, cosmopolitan city in which ‘the Welshman’s love of music and art’ would make ‘the Coventrian of 25 years hence a better man in body and possibly in brain.’ (77) This comment reveals a more positive, forward-looking attitude among the ‘host’ population than the more ‘hostile’ reaction experienced by the Cowley Welsh, as previously described, whose role in that City’s ‘progress’ seemed only to be recognised, in retrospect, by its left/liberal intelligentsia and newspaper media. The class divide in Oxford between town, gown and the new working classes, which prevented the formation of a citywide Welsh Society did not seem to be a problem in Coventry, where the Welsh working classes were obviously more dominant in music, culture and sport. The creation of a ‘Society’ helped to further fulfil the need for respectability. One evening every month a ‘social’ was held in a large room above Ellis’ Cafe in Broadgate, to which Welsh people came to play games and to sing, from all over Coventry. Welsh was spoken, but the Society was obviously not dominated by academics, as in Oxford, and was able to meet a need for ‘gathering’ or ‘gymanfa’ among the wide variety of Coventry Welsh, which included nurses and school teachers as well as factory workers. This image of respectability had become well established by February l929, when the Society and the Gleemen combined to give a performance in aid of the Lord Mayor (of London’s) Fund for the Distressed Areas. The Midland Daily Telegraph praised the ‘careful training given by Mr. Shepherd to his singers’ during their weekly rehearsals. The exiles’ empathy with those they had left behind was portrayed to full effect, if in somewhat bizarre fashion, when Miss Chrissie Thomas played ‘God Bless the Prince of Wales’ as an encore on her mandolin, ‘in reference to the Prince’s recent visit to the distressed areas.’ At the end of that month the Coventry Welsh were able to give vent to ‘their intense national patriotism’ at the Welsh Society’s Annual Social. (78) Events such as these were symbolic of a growing sense of solidity and self-confidence in the immigrant community. Most importantly, Welsh working class culture was able to locate itself within a broad, dominant working class and immigrant culture in Coventry; such a culture was poorly developed in Oxford and was almost entirely absent in the ‘Greater London’ experience. Coventry was, from the beginning of the period, a working class city, in which miners and immigrants were not strangers. One among them contrasted his experience of Coventry with that of London by stating that in Coventry he felt that he was back in his ‘own sphere amongst the working class’ with ‘everybody working at our level’ and was ‘sharing similar characteristics’ with former miners from the Durham coalfields. (90) This was the type of environment in which the Welsh could establish and assert themselves, not perhaps as so distinctive a community as in Oxford, but with similar stimulating and stabilising effects both on the processes of migration and settlement and on the development of the city itself. These case studies of the Welsh working class inter-war experience of exodus and resettlement reveal that the contemporary, and sometimes historical, characterisation of migration as synonymous with enforced dispersal, implied by the indiscriminate use of the term ‘Transference’, does not match the diverse realities of that experience. Those who were moved under government schemes made up a small minority of those who left the coalfield. The experiences of atomisation, isolation and alienation endured by many transferees and migrants who entered employment in domestic service, the distributive trades and relief work in London and other parts of the south-east of England, were not shared by those who found employment for themselves in the developing centres of the new industries. In these centres, despite significant variations in local patterns of employment and housing, the processes of migration and settlement were conducted on a collective and largely autonomous basis, which reflected the traditions and institutional life of the coalfield communities. The careful cultivation of migration networks through a combination of marital, familial, fraternal and institutional relationships ensured that migrants were able to retain a collective identity and distinctive working class culture in their new environment. Their concern for, and idealisation of, the communal life they had left was an essential stabilising and reinforcing element in their projection of a self-image of a hard-working and respectable immigrant community. Most importantly, their retention of the capacity for autonomous organisation in all the stages of the migration process meant that, in these centres, they were able to act as self-assured, self-empowered agents in the formation and negotiation of a broader working class culture which met the new industrial and social conditions of their chosen environment. This, then, was no Babylonian captivity, and in their transportation of traditional values and institutions they fashioned a ‘new covenant’ made up of various contributions to the economic, political, social, cultural and religious life of the new industry centres. By these means, they also enabled and enhanced the recovery and reconstitution of working class politics and culture in the l930s. Coming from ‘Proud Valleys’, they were determined to prove that no one could stop them singing. (103) In 1927 they may have felt like extras in an epic which ran out of backers, but by 1937 they were setting the scenery for a new post-war production in which one of their own, Aneurin Bevan, played a leading role and they were the chorus. The manner in which they overcame the prejudices they met over much of the inter-war period, demonstrates the importance of perspective in examining the true nature of migration and immigration in twentieth-century Britain. The locally-grown ‘model’ followed in Britain by ‘guest’ and ‘host’ communities alike, although sometimes painful in construction, has been one of integration, rather than one of assimilation. Coventry Tribune ,19 July 1947. M. Abrams, The Condition of the British People, 1911-45: A Study prepared for the Fabian Society (Gollancz, 1945), Preface by G D H Cole; chapters I & II, tables I & II. PRO Lab 23/102: ‘Report of a Conference on Transference, convened by the South Wales and Monmouthshire Council of Social Service, 15-16 May 1936’. W.Hannington, The Problem of the Distressed Areas (Gollancz,1937) chapter eight, especially p.124. K.O. Morgan, Rebirth of a Nation (Oxford 1981) pp. 230-231. PRO/Lab 8/218: Hunt & Scott’s report. F.C. Bourdillon, A Survey of Social Services in the Oxford District (Barnett House Survey, Oxford,1938) p.60; Bodleian Library/Butler Papers, box 40, paper by S.P.R. Maud. See my thesis, op.cit., chapter one & appendices. G.H. Daniel, ‘Some Factors Affecting the Mobility of Labour’ in Oxford Economic Papers, (1940) p.152. The precise details of the scheme are given in journal Planning, 24 March 1936. See my thesis, chapters five and six for further details. Ibid. ; ‘note on Miss Hilda Jennings’ Investigation into Social Transference Problems’, August 1935, pp.1-2. 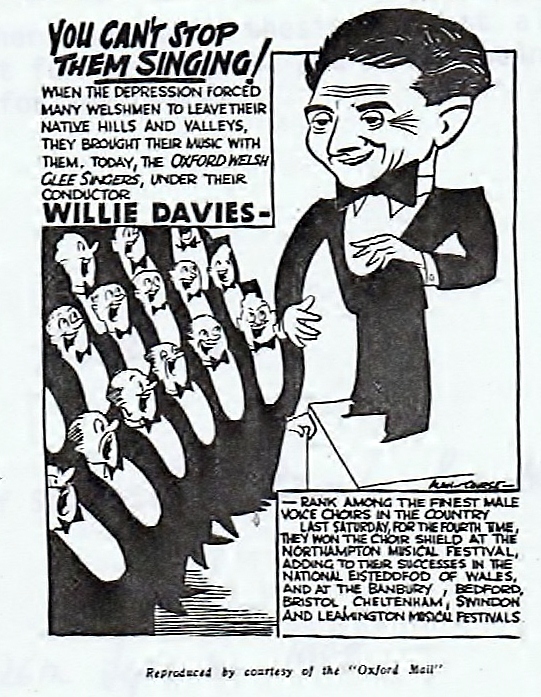 M. Davies, ‘Exiled in London’ in The Listener, 20 April 1938. PRO/Lab 23/102; SWMCSS Committee on Transference; ‘Preliminary Report on Social Provision at the Reception End for Workers Transferred from South Wales’ by A.J. Lush, 2 April 1937 pp. 7-8. Ibid., pp.9-10: Many of the newcomers had initially been brought to Slough to work in the Government Training Centre; see PRO/Lab 2/1396/ET 1275; Reid letter: On Lady Astor, see Peter Stead’s article on ‘The Voluntary Response to Mass Unemployment in South Wales’ in W. Minchinton (ed. ), University of Exeter Papers in Social and Economic History, 1981. G. Crawshay, ‘Survey and Prospects of the Position in the South Wales and Monmouthshire Special Area’ in The Special Areas Commissioner’s Fourth Report, November 1937,p.43ff. : H.A. Marquand, The Second Industrial Survey of South Wales (Cardiff,1937; National Industrial Development Council), Volume III, p. 28. Idris Davies, ‘London Welsh’ in Gwalia Deserta (London, 1938). Ibid., pp. 58-60; appendix 1, p.290. See also PRO/PIN 7/172; extract from the typescript drafts of the Survey Report, pp.20-21. G.H. Daniel, ‘Labour Migration and Age Composition’ & ‘Labour Migration and Fertility’ in The Sociological Review, May & October, 1939, especially p. 297; ‘Some Factors Affecting the Mobility of Labour’ in Oxford Economic Papers, 1940, esp. p.157. R.C. Whiting, ‘Oxford Between the Wars; Labour and the Motor Industry’ in Rowley (ed.) The Oxford Region, (n. d.) & his Oxford D. Phil. thesis, ‘The Working Class in the “New Industry” Towns Between the Wars; The Case of Oxford’ (1978); J. Zeitlin, ‘The Emergence of Shop Steward Organisation and Job Control in the British Car Industry; A Review Essay’ in History Workshop Journal (Autumn 1980); D. Lyddon’s ‘Critique’ & Zeitlin’s ‘Rejoinder’, both in HWJ (Spring & Autumn, 1983); P.D. John, ‘The Oxford Welsh in the 1930s; A Study in Class, Community and Political Influence’ in Llafur, Volume 5, Number 4, 1991; draw on my thesis, op. cit., chapter seven. Interviews with T. Richards, D. Husk, Cowley, 1982, transcribed, loc. cit. Glamorgan Gazette, 31 December 1926. Interview with D. Husk; Oxford Times, 20 March 1931; Glamorgan Gazette,24 April 1931: Davies was son of a Blaengarw miners’ agent. Interviews with T. Richards, Vyall Allport & Mrs. I. Price (née Allport), D. Husk; OCL/Pressed Steel Company, Social & Athletic Club; Rugby Football Club minute book, 3 October 1927; Pressings (Pressed Steel Company magazine), January 1928: This contains a photograph of the first season’s team; names & places of origin of the players were supplied by Dai Husk, the former also appearing in the minutes. OCL/Pressed Steel Co. Social & Athletic Club minute book; Secretary’s report for the 1936-37 season; Oxford Times, 25 June 1937; September-December 1927; 27 July 1927; 23 April 1937; Glamorgan Gazette,13 & 27 July 1934; interview with the Wilcox family, Cowley, 1982, transcribed. Interview with T. Jones, Cowley, 1982, loc. cit. Glamorgan Gazette, 23 December 1927. Interviews with F. Jeffery, T. Jones, T. Richards, loc. cit. Oxford Times, 4 & 25 October, 1929; Temple Cowley URC records, ‘Order of Service, November 27th, 1932’; interviews with F. Jeffery, T. Richards, loc. cit. Ibid. ; interview with F. Jeffery, loc.cit., interviews with Haydn Evans, Cowley, 1982, transcribed: Interviews with T. Richards, T. Jones, loc. cit. Glamorgan Gazette, 10 April 1931; Oxford Times, 3 April 1931; 20 March 1931; Oxford Welsh Glee Singers’ Attendance Register, 1931-39; Minutes 14/26 Jan, 2 Feb 1936. Glamorgan Gazette, 13 July 1934; January-September 1937 (10 references); interviews with C. Jones, Wilcox family, H. Evans, loc. cit. Daniel, op. cit., (1940), pp. 174-179. NUVB Journal, November 1925, January 1929, January 1930; NUVB Oxford Branch Minute Books, August 1927. See note 25 above; for unemployment and migration statistics, see my thesis, appendix ten. Interviews with T. Richards, D. Husk, op. cit. OCL/Howse Collection; pamphlet, 6 October 1932 and Company memorandum, 7 October 1932. Interview with Jack Thomas, Cowley 1982, op. cit. Interview with H.Evans, op.cit. ; The Conveyor, September 1934, p.2. RCL/Abe Lazarus Collection; MSS 1/4; ‘note on Harris by J. Mahon’; also information from interviews with H. Evans, T. Richards, T. Jones, loc. cit. : On Welsh transatlantic migration to Scranton, Pennsylvania, US, see W D Jones (1993) Wales in America: Scranton and the Welsh 1860-1920. University of Wales Press. Interview with J.Thomas; D.McEvoy, ‘From Firm Foundations: A Study of the Trade Union Recognition Strike at Cowley : July 13 to 28, 1934′, Dissertation for Cert.Ed., Oxford 1972 chapter five, passim. The Conveyor, loc. cit., p.2. Oxford Times, Daily Worker, 27 July 1934; H. Evans interview, loc. cit. The Conveyor, loc. cit, p.5. Glee Party Attendance Register; R. Bedwin, Fifty Years of Song; A Brief History of the Welsh Glee Singers,1928-78 (Oxford 1978) p.10. Daniel, op. cit., (1940) p.178. RCL/Abe Lazarus Collection: Oxford Trades Council Minutes, Dec 1934 – March 1936; circular letter to members of the Oxford Local of the Communist Party; J. Thomas interview, loc. cit..
‘Television History Workshop; Making Cars’ (video) (London,1985), pp.24,33. Interviews with J.Thomas & Arthur Exell, op. cit. OCL/Howse Collection; The Spark, March 1937. BL/Butler papers; Barnett House Survey of Trade Unions, 1937; OCL/Howse Collection; list of TGWU shop stewards, 28 April 1938; BL/Butler papers/Box 43; letter from O. Moeller to Bourdillon, 1937; Howse Collection; memo. from Howse to Moeller,6 December,1938. Oxford Trade Council Minutes, November-December 1938; interviews with J. Thomas, T. Richards, T. Jones, H. Evans, loc. cit. A. Exell, ‘The Politics of Production Line’, HWJ, 1981. Interview with H.Evans: Interview with Wilcox family, op. cit; see my thesis, chapter five. Butler papers/Box 43; letter to Plummer, 12 July 1937. RCL/ACL/MSS 1/4, ‘A Long Climb Beyond Dreaming Monuments’ n.d.
For more information on the leading role of Welsh personalities in the Oxford Labour Movement, see; Oxford Labour Party Minutes, 31 July & 4 September, 1935, 1935-1939; Oxford Times, 3 January 1958; R. Crossman’s introduction to G.Hodgkinson, Sent to Coventry, (1970); Oxford Times, 23 April, 18 June, 24 September 1937, 3 January 1958; Oxford Mail, 25 June, 1979; OCL/PAC Minutes, 13 December 1938; Oxford Times, 15 January 1937. The Gazette (Oxford T.U. paper), February 1938. See my thesis, pp. 314-5 (notes 181-2) & p.208ff. CRO/Minutes of Coventry PAC, 6 May 1936; interview with H. Roberts, loc. cit; on the length of unemployment before migration, see my thesis, chapter five. See my thesis, op. cit., p. 316, and notes 191-2. Interview with Mrs. J. Shepherd, Coventry, 1982, transcribed. Interviews with Mrs. J. Shepherd, Mary Nicholas & Martha Jones, Coventry 1982; C. Binfield, Pastors and People; The Biography of a Baptist Church; Queens Road, Coventry (Coventry 1984), chapters 11-13. Midland Daily Telegraph, 11 February 1929, 1 September 1937. Interview with Mrs. Shepherd, loc. cit; Midland Daily Telegraph, 6 & 11 January, 28 February 1929. Interview with H. Roberts, loc. cit. Midland Daily Telegraph, 27 May 1939. NCVO/NCSS local files; letter from Handley to Deedes. Baptist Times, 5 April 1956, obituary by Rev. W. Davies. Interviews with Mary Nicholas & Martha Jones, loc. cit. ; Binfield, loc.cit., wrote that Queens Road was known as ‘New South Wales’. Midland Daily Telegraph, 1936; Mrs J. Shepherd, Mary Nicholas & Martha Jones gave information about his sermons, loc. cit; see also Binfield, loc. cit., p.215, re. the ‘How Green Was My Valley’ sermon. CRO/708/Richardson papers; Rev. G.Hastings, ‘Queens Road Baptist Church, Coventry, in the Life of the City’, February 1969. H.I. James, Communism and the Christian Faith (1950) pp.5, 82-3, 172. Ibid. ; Midland Daily Telegraph, 12 May 1939. Midland Daily Telegraph, 22 January 1929; H. Roberts interview, loc. cit. Coventry AEU Minutes, 24 April 1939. Interview with H. Roberts, loc. cit. ; see my thesis, chapters five & seven. J.A. Yates, Pioneers to Power (Coventry,1950) pp.69-70, 73, 81-83; K. Richardson, Twentieth Century Coventry (1972) pp. 189-207. Midland Daily Telegraph, 2 November 1937; 20 July 1938. Coventry Evening Telegraph, 2 May 1965; South Wales Daily News, 3 December 1926; Coventry Evening Telegraph’s Who’s Who, 1977. Coventry Who’s Who, 1985. PRO/Lab 23/97, BARDA: General statement & Report to Feb. 1936. See my thesis, pp. 298-301. For more on the Welsh personalities in the Birmingham Labour Movement, see my thesis, p.318 (notes 226-232); plus N. Tiptaft, My Contemporaries (Birmingham, 1952) p. 40ff. ; and see also R.P. Hastings, ‘The Labour Movement in Birmingham’, University of Birmingham M.A. Thesis (1959) pp. 62-64. Oxford Mail, ‘You can’t stop them singing’, reproduced by the OWGS as a postcard, copy in the choir’s archive, n.d.; used as part of a frontispiece to my thesis (p. ii).